The federal government and 11 states have joined together to accuse 30 purported debt relief operations of using deception and false promises to swindle more than $95 million from student loan borrowers. “Operation Game of Loans” — the eyeroll-worthy code name for the investigation — culminated today with the Federal Trade Commission and attorneys general from 11 different states bring multiple actions against alleged scam companies that marketed themselves as providing debt relief services. 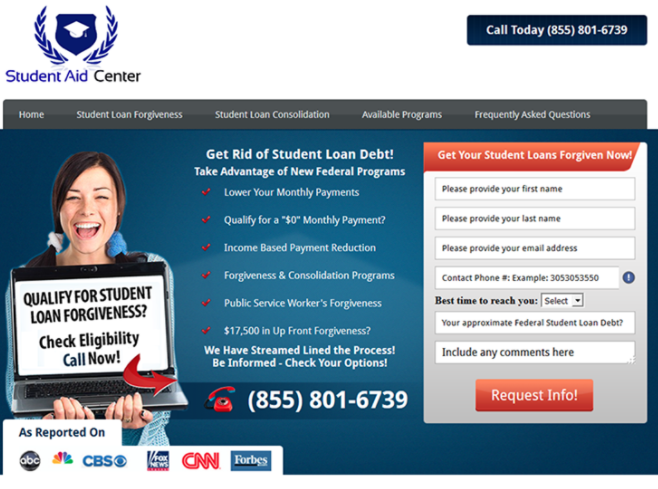 According to the FTC, the companies involved in these actions charged consumers illegal upfront fees, falsely promised to help reduce or forgive student loan debt burdens, and pretended to be affiliated with the government or loan servicers, in violation of the FTC’s Telemarketing Sales Rule and the FTC Act. The AGs taking part in Operation Game of Loans include those from Illinois, Colorado, Florida, Kansas, Maryland, North Carolina, North Dakota, Oregon, Pennsylvania, Texas, Washington, and the District of Columbia. The FTC recently filed five new cases against 30 debt-relief operations, obtaining a temporary restraining order against each defendant, halting their alleged scams and freezing their assets. In the first case, filed in federal court in California, the FCT charges that A1 DocPrep took at least $6 million from individuals by promising to provide customers with relief from their student loan or mortgage debts. According to the complaint [PDF], the company claimed to be from the Department of Education, and promised to reduce borrowers’ monthly payments or forgive their loans. The FTC alleges the A1 DocPrep targeted distressed homeowners, making false promises to consumers that they would provide mortgage relief and prevent foreclosure. However, instead of helping these customers, A1 DocPrep’s CEO, Homan Ardalan, allegedly spent hundreds of thousands of dollars the company received from customers on cars, jewelry, nightclubs, and restaurants, according to the FTC. Also named in the complaint are Stream Lined Marketing, Project Uplift Students and Project Uplift America, and Bloom Law Group PC, Home Shield Network, and Keep Your Home USA. In lawsuit filed in Florida federal court, the FTC and Florida AG’s office claim that American Student Loan Consolidators (ASLS) and BBND Marketing bilked more than $11 million from student borrowers. To do this, the FTC claims that since 2013 ASLC and its related operations promised customers they could provide loan forgiveness, lower monthly payments, and reduced interest rates if they paid upfront fees, typically up to $799. According to the complaint [PDF], the company, which purported to be affiliated with the Dept. of Education and loan servicers, said these fees would be applied to the individual’s student loans. In many instances, however, consumers discover that the companies had failed to enroll them in any payment reduction or debt forgiveness programs and have otherwise failed to reduce their payments or interest rates or eliminate their student loan debt. As a result, many borrowers fell behind on their student loan payments or incurred addition interest on their tabs. Another lawsuit filed in California federal court accuses Los Angeles-based Alliance Document Preparation of taking more than $20 million from student loan borrowers by charging illegal upfront fees for purported debt relief services. According to the complaint [PDF], since at least 2015 Alliance Document Preparation charged customers fees of up to $1,000, promising alumni of for-profit colleges that it could enroll the borrowers in programs that provide loan forgiveness, permanently reduced monthly payments, reduced or eliminated interest rates, or loan discharge. The company, which targeted customers through social media posts, purported to be affiliated with the Dept. of Education or student loan servicers. When a potential customer contacted the company, a rep would allegedly create a false sense of urgency by claiming that funding would only be available if they signed up for services immediately. In short, the FTC claims that consumers pay the companies for promised loan forgiveness or permanently reduced monthly payments, but in most instances, receive neither the promised loan forgiveness nor permanently reduced monthly payments. Companies and individuals named in the complaint include SBS Capital Group; SBB Holdings; First Student Aid; United Legal Center; United Legal Center; Elite Consulting Service; Grads Doc Prep; Elite Doc Prep; Benjamin Naderi; Shawn Gabbaie; Avinadav Rubeni; Michael Ratliff; Ramiar Reuveni; and Farzan Azinkhan. The companies also operated under the names Grads United Discharge, Allied Doc Prep, Post Grad Services, Post Grad Aid, Alumni Aid Assistance, United Legal Discharge, First Grad Aid, Academic Aid Center, Academic Protection, Academy Doc Prep, Academic Discharge, and Premier Student Aid. A complaint filed in Florida federal court accuses Fort Lauderdale-based Student Debt Doctor (SDD) and its owner, Gary Brent White, Jr., of collecting more than $7 million in illegal upfront fees from customers seeking student loan debt forgiveness. According to the complaint [PDF], since 2014 SDD has used social media, email, and telemarketing to promote promises that it could provide customer with loan forgiveness in as little as five years. In order to achieve this forgiveness, the company charged customers upfront fees up of more than $750 to purportedly enroll the individual in repayment or debt-forgiveness programs. The reps, which also allegedly told individuals not to communicate with their loan servicers, said they would work with customers’ servers to reduce the debts. In reality, the complaint alleges that the companies did contact servicers, but only to place customers’ loans in temporary forbearance. In the end, the FTC claims that customers found that they were never enrolled in a repayment program and their debts were not eliminated or reduced. Instead, their debts continue to incur fees and often went into default. In another complaint [PDF] filed in California federal court, the FTC accused Los Angeles-based M&T Financial Group and American Counseling Center Corp. — doing business as Student Debt Relief Group — of bilking at least $7.3 million from consumers struggling to repay their student loans. According to the complaint, since 2014 the companies — which claimed to be affiliated with the Dept. of Education — targeted anxious and confused student loan borrowers with aggressive outbound telemarketing calls that included illegally contacting people on the National Do Not Call Registry. The telemarketers would promise customers they could qualify for federal programs that would permanently reduce their monthly loan payments to a fixed amount, the FTC complaint states. To access these government programs, the reps told consumers that they must pay an advance fee of up to $1,047. They also allegedly charged consumers monthly fees they claimed would be credited toward their student loans. The companies also allegedly deceived consumer into providing them with their Social Security numbers and Federal Student Aid identification numbers. This allowed the operation access to customers’ accounts. As with other debt relief operations facing complaints from the FTC, SDRG also allegedly told customers not to communicate with loan servicers. In some cases when customers found they had been scammed, they would attempt to cancel or block their accounts to prevent further charges. However, the FTC claim that these customer would then receive threats from the companies that their accounts would be sent to collections and their credit scores negatively affected. In addition to the five new cases against purported debt relief operations, the FTC announced today that Operation Game of Loans included two pending actions against 11 companies. A federal court in Southern Florida issued summary judgment [PDF] in the FTC’s favor related to a complaint filed against the Student Aid Center and operator Ramiro Fernandez-Moris. The complaint [PDF], filed by the FTC and state of Florida, accused the company of taking more than $35 million from student loan borrowers by enticing them to sign up for services using misleading and false claims. According to the complaint, since 2010 Student Aid Center misled consumers into believe that they could receive loan forgiveness or modification if they paid unlawful upfront fees in the form of five monthly payments of $199 or more. While the court issued summary judgment, a final order related to relief will be made at a later date. A Florida federal court entered a stipulated preliminary injunction [PDF] in the FTC’s case against Strategic Student Solutions. With the injunction, the court froze the company’s assets, halted its student loan debt relief operation, and appointed a receiver to control the business. According to the FTC’s complaint [PDF], the company took more than $11 million from customers by falsely promising to reduce or eliminate their student loan debt and offering them non-existent credit repair services. In exchange for the promised debt relief and credit repair services, the company allegedly charged illegal upfront fees of as much as $1,200 and monthly fees, typically of $49.99. While the operation claimed the monthly fees would be paid toward their debt each month, that was not the case, the FTC claims. As part of Operation Game of Loans, the FTC today released recourses intended to assist borrowers in avoiding debt relief scams. As a rule of thumb, consumers should remember that only scammers promise fast loan forgiveness, and that scammers often pretend to be affiliated with the government, the FTC notes. Borrowers should never pay an upfront fee for help, and should not share their FSA ID — a username and password used to log in to Dept. of Education websites — with anyone. Additionally, borrowers can apply for loan deferments, forbearance, repayment, and forgiveness or discharge programs directly through the Dept. of Education or their loan servicer at no cost. These programs do not require the assistance of a third-party company or payment of application fees. For more information on avoiding debt relief scams, visit the FTC’s consumer education center.